Using a sophisticated combination of computer simulations and statistical techniques, scientists at Stanford University have shown that the extreme atmospheric conditions associated with California's lengthy drought are likely caused by today's global warming conditions. The new research shows that the immediate cause of the California drought appears to be a stubborn "blocking ridge" over the northeastern Pacific, which climate scientists have charmingly dubbed the Ridiculously Resilient Ridge, or "Triple R." It prevented winter storms from reaching California during the 2013 and 2014 rain seasons. And according to lead researcher Noah Diffenbaugh, this persistent region of high atmospheric pressure was much more likely to form in the presence of modern greenhouse gas concentrations. Just How Bad Is California&apos;s Drought? Here&apos;s A Scary, 10-Second Answer. 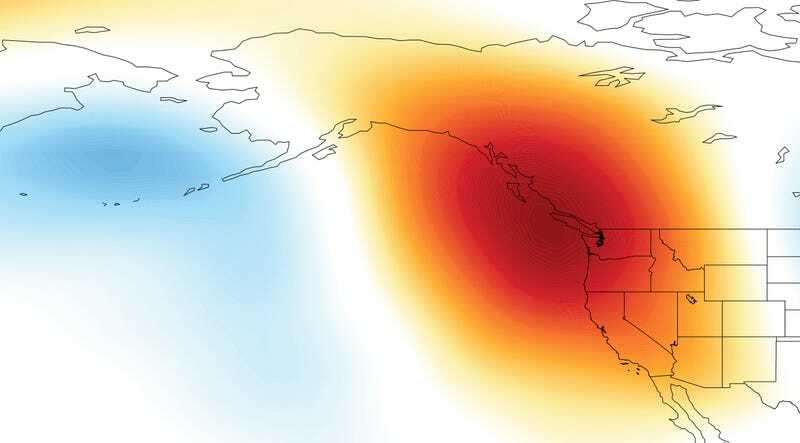 "Our research finds that extreme atmospheric high pressure in this region – which is strongly linked to unusually low precipitation in California – is much more likely to occur today than prior to the human emission of greenhouse gases that began during the Industrial Revolution in the 1800s," noted Diffenbaugh in a Stanford statement. Blocking ridges occur periodically at temperate latitudes, but the Triple R was exceptional for both its size and longevity. While it dissipated briefly during the summer months of 2013, it returned even stronger by fall 2013 and persisted through much of the winter, which is normally California's wet season. "At its peak in January 2014, the Triple R extended from the subtropical Pacific between California and Hawaii to the coast of the Arctic Ocean north of Alaska," said Swain, who coined the term "ridiculously resilient ridge" last fall to highlight the unusually persistent nature of the offshore blocking ridge. Like a large boulder that has tumbled into a narrow stream, the Triple R diverted the flow of high-speed air currents known as the jet stream far to the north, causing Pacific storms to bypass not only California but also Oregon and Washington. As a result, rain and snow that would normally fall on the West Coast was instead re-routed to Alaska and as far north as the Arctic Circle. Using the Triple R as a benchmark, the researchers compared geopotential heights (i.e. an atmospheric property related to pressure) between two sets of climate model experiments. One set represented the current state of our climate and the associated levels of carbon dioxide and greenhouse gases, while the other was kept at a level similar to those that existed prior to the Industrial Revolution. Computer modeling showed that the conditions associated with the Triple R are far more likely to occur now. Related: The U.S. Southwest Could Soon Experience Decades-Long "Megadroughts"
Read the entire study at The Bulletin of the American Meteorological Society. Supplemental information via Stanford University. Top image: Image via Daniel Swain, Stanford School of Earth Sciences.